Final exams are over and I'm finally home for Christmas break! Last night my family and I picked out and decorated our Christmas tree while listening to the Justin Beiber Christmas album and it was so so fun (it's the little things, right?). I've definitely been doing jeans more often, too. It's just been way to chilly! 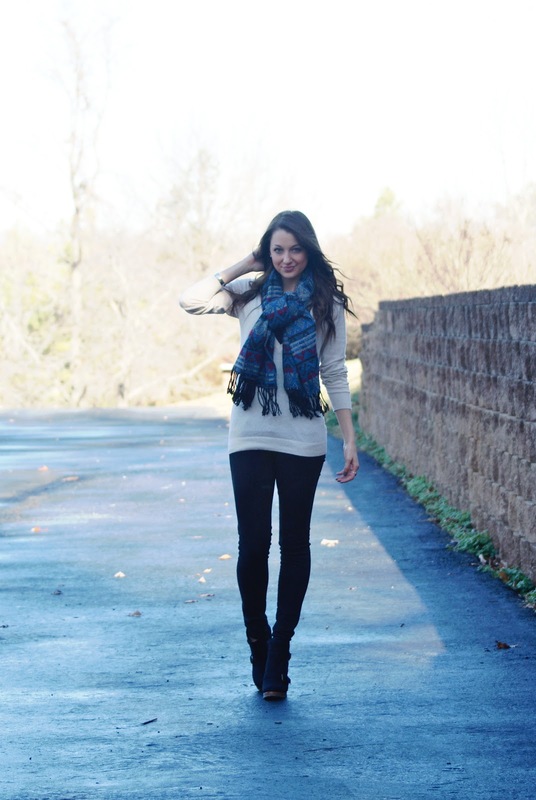 :) Love the scarf you're wearing and those booties are adorable ! I'm so jealous your done with school. I've still got another week! Your outfit is gorgeous. I love wearing casual, it is the most compfy. Especially during all the winter months. Hi Jacy, so glad to hear your exams are over, you can finally get a well deserved break! Even in a casual outfit, you always portray sophistication and poise. I love the Biebs Christmas cd!! :) Your outfit is so simple but elegant & comfy! Love your scarf. Very cute and comfy look ,Jacy! Enjoy your time off and I am glad I will see you more often here! Super cute! You have legs for days girl! Such a cute outfit! I love your scarf! Congrats on being done with finals! Thats always the best feeling. I love your outfit! It's super cute and looks so comfy! Have fun with your fam! Ah. Absolutely lovee the shoes! Those booties are absolutely and ridiculously amazing!!! Super chic. stumbled onto your outfit and had to check out your previous posts! i love your outfits. its so simple and chic and thats my kinda style. i love this outfit you have on as well! Cute casual outfit. Congrats on finishing finals!! Lovely casuall look.=) Love the scarf. Hi girl! I love your blog so much! Love your style too! I have nominated you for a Liebster award, check out my post for the details! Congrats!